31133 -- a 100 grain HP for the .32-20 Winchester, "They increase the killing powers of .32-20 rifles greatly." 31945 -- a 150 grain HP for the .32-40, "They increase the killing power of the rifle greatly for deer, bear, etc." 37577 -- a 235 grain HP for the .38-55, "The .38-55 rifle with express bullets are sure killers of deer and elk." 40090 -- a 165 grain HP for the .38-40 Winchester, "Those who have .38-40 rifles can increase their killing power by 50% by using express bullets." 40393 -- about 330 grain HP for the .40-65, .40-70 and .40-82 Winchesters, "Every person owning one of these rifles should have an express mould as they greatly increase the killing power for larger game." 42499 -- 195 grain HP for the .44-40 "Hunters will find that the killing qualities of their .44-40 rifles are increased 50% by use of this bullet." 456122 -- the Gould bullet, designed by John Barlow for A. C. Gould, the editor of Shooting and Fishing; a 330 grain HP for the .45-70, "It has a great reputation as a killer of large game." 512139 -- a 300 grain HP with a gaping cavity "This is the standard .50 Winchester Express bullet." Note that John Barlow designed these bullets for rifle cartridges, specifically black powder rifle cartridges, and therein lies the secret to the soul of the cast HP. Generally speaking, these cartridges were loaded with BP to muzzle velocities of 1100-1600 fps (most commonly in the range of 1200-1400 fps), and this is why the cast HP’s worked so well and were so well received by the hunters of the day (men like Col. Pickett and A. C. Gould) -- the guns that they were initially developed for did not over-stress them. Thus, the cast HP delivered excellent expansion and deadly performance on deer, black bear and elk. This is also why cast HP’s are such a good fit for the handgun hunter -- many handguns also operate in the velocity regime of 1100-1600 fps, especially around 1200-1400 fps. Modern handgun hunters can learn much from the old black powder rifle hunters because of this common ground. Elmer Keith used some of these early HP’s in some of his revolver loads and he recognized early on the value of cast HP’s in sixguns. Shortly after he designed his landmark SWC bullets in 1928-1931 (the 429421, 452423, 454424, and 358429), he came back and had Ideal make HP versions of these same bullets. These SWC’s and HP’s were his favorite hunting bullets for the next 50 years. Phil Sharpe did much the same thing in the mid-1930s with the bullets he used in the development of the .357 Magnum (the H&G #51, aka the 160 grain Sharpe solid and 146 grain Sharpe HP). It is worth noting that Elmer typically loaded his cast HP loads initially between 1100-1200 fps, and then later with the introduction of the .44 Magnum at 1400 fps, and he reported excellent expansion on game animals like mule deer and elk. Sharpe loaded his HP’s to 1500-1600 fps in the .357 Magnum, where they expanded violently and delivered devastating blows to bobcat-sized game. Do you notice a trend here? First with the black powder riflemen, and then later with the sixgun experiments of Elmer Keith and Phil Sharpe, we find knowledgeable hunters using cast HP’s at 1100-1600 fps (mostly 1200-1400 fps) and obtaining outstanding hunting performance ... hold that thought. Generally speaking, the early casters were working with binary lead-tin alloys, typically something around 20 part lead to 1 part tin (Elmer Keith's favorite was 16-1). These alloys have a Brinell Hardness number (BHN) of around 9-10, and are very malleable (meaning they expand smoothly and don't tend to fragment). The performance of 1-20 Keith HP's at around 1200 fps has to be seen to be believed -- recovered bullets are typically the most perfect little leaden mushrooms you've ever seen, and with very little weight loss. Black powder shooters sometimes used 30-1 alloy to cast their HP’s for lower velocity BP loads (e.g. 1100 fps). Alloys used by bullet casters today (for example, wheel-weight alloy) commonly have antimony in them. Does this cause problems? Well, antimony is far more efficient at hardening a lead alloy than is tin, so only a little bit is needed. While lead-tin alloys tend to be very malleable, lead-antimony alloys tend to be more brittle, meaning they fragment more readily. Three component lead-tin-antimony alloys (like WW alloy and linotype) are intermediate between these two binary alloys. The bottom line is if you're using one of these tertiary alloys, blended to a suitable hardness for HP applications (i.e. BHN of somewhere in the range of 8-14, depending on velocity), then you'll most likely get good performance out of your HP’s. In my experience, WW alloy (BHN about 12) works just fine for cast HP’s at magnum revolver velocities (ca. 1400 fps), and WW cut with a equal portion of lead (BHN about 9) works very well for cast HP’s at 1000-1200 fps. For example, several years ago I shot a large mule deer doe over on the Snake River outside of Pullman, Washington using a .41 Magnum revolver (S&W 657 Classic Hunter) loaded with the Lyman 410459 HP at about 1400 fps. It was a 50-60 yard shot, with her quartering slightly away from me. The cast HP entered behind the left shoulder, about halfway up, and exited low in the point of the right shoulder. There was extensive lung damage, and the heart was center-punched. She ran less than 20 yards and piled up. The exit wound was about the size of a quarter. She came to rest facing downhill and was essentially bled out when I got down to her. The cast HP (BHN about 12) at 1400 fps had expanded beautifully, and punched right on through. Another mulie doe I shot in that same canyon the year before fell to a cast HP in a .44 Magnum revolver. This time I was using the Devastator HP that Lyman still offers (the 429640 HP). This bullet weighs about 268 grains when it drops from my mould cast with WW alloy. I was shooting it at about 1350 fps from my 6" S&W 629 Classic Hunter. This deer fell to a neck-shot, and the cast HP expanded well and took out significant chunk of spine and exited (she collapsed on the spot, obviously). A friend of mine reported that he shot an adult cow buffalo with the Lyman .44 Devastator HP and got complete penetration on a broadside ribcage shot. In this case the bullet was launched at about 1200 fps from a short-barreled Ruger SBH, at fairly close range. Damage to the lungs was extensive and the buffalo went down very quickly (after about 20 feet, as I recall). What I find remarkable about this report is the fact that it exited from an animal of this size. Another example of how cast HP’s at moderate velocity can provide both controlled expansion and deep penetration is found in a 700 pound boar that I "collaborated" on. A friend of mine had wounded a huge old boar, but was having difficulty following-up due to some very thick brush. I came in above the brush and shot twice with a .44 Special loaded with the 429251 HP at 1200 fps (the HP version of the classic RN design; these bullets were cast to a BHN about 8). Both shots were broadside, in the ribs, at point blank range. The boar went down seconds later. One shot exited and the other was found under the hide on the far side. Based on the wound channels, both bullets had expanded beautifully. The recovered bullet was approximately 60 caliber and weighed 194 grains (it started out at about 240 grains). John Taffin had a very similar experience with his Texas Longhorn Arms .44 Special on a couple of big ol' hogs using some 429421 HP’s that I cast up for him out of 20-1 alloy. For the details, I suggest you read about it in his excellent book "Single-Action Sixguns". Cast HP’s certainly can be launched at faster speeds, and with very good accuracy. I have gotten some excellent groups with certain cast HP’s at speeds well in excess of 2100 fps, but would these make good hunting loads? I wanted to learn more about how cast HP’s behave at these velocities so I would have a better idea about the best way to structure my hunting loads. So I did a little testing (actually, a lot of testing...). My standard test for bullet expansion is to fill a 2L pop bottle with water and lay it on its side so I can shoot through it lengthwise. I back this with a tightly bound "bale" of newspapers (about 6-8" thick) that are leaning against the cap of the 2L pop bottle such that the bullet will cause the bale to fall away on impact. I bind up the bale with duct tape, and arrange things such that the bullet will have to pass through the duct tape upon entering the bale. This allows me to see what size the bullet was after expanding in the water bath, but before it breaks apart in the newspaper (dry newsprint is very hard on a bullet). Now some people say that using water to test bullet expansion is not a valid test method because water is "hard" on a bullet. The reason they say this is because water is an incompressible fluid, and if you shoot into a large body of water (like a lake or a swimming pool) there is nowhere for the water to go as the bullet passes through, so the bullet experiences greater resistance and may expand more under those conditions than if it were passing through, say, a whitetail buck. This is all well and good. However, shooting through a 6" cylinder of water held together with a thin, stretchy layer of polyethylene means that the water can, and does, get pushed out of the bullet's way. While the water itself is no more compressible under these conditions than it is in the swimming pool, it provides far less resistance to the bullet's passing due to the fact that it gets pushed aside. The bottom line is this test has proven to be a reliable (and reproducible) method for evaluating bullet expansion, and I've learned a lot about cast HP’s using this test. For example, recently I've been playing around with a HP version of the 358315, the 200 grain GC-RN made for the .35 Remington. I did a little lathe work to convert the mould to drop HP bullets, and in the process gave it a .200" flat meplat, ideal for tubular magazines. I played around with various HP cavity configurations, and ultimately settled on a cavity that was .085" diameter, and about .375" deep (with a 5 degree taper). The 358315 HP has proven to be a very accurate bullet. Performing the expansion tests described above and varying the muzzle velocity from 1500 fps to 2100 fps revealed a great deal (generally these bullets have been cast to a BHN of 13, a little harder than average WW alloy). At 1500-1600, this bullet expanded smoothly. At 1800 fps it expanded very nicely, but started to show some hints that it might be on the verge of fragmenting. At 2000-2100 fps, the 358315 HP fragmented violently, peppering the duct tape with dozens of bullet fragments. It is interesting to note that even when it fragmented violently the recovered bullet bases still retained about 100 grains of bullet metal. Based on these tests, I am inclined to work up hunting loads with this bullet in the 1600-1800 fps range. But do these test results jive with those on living, breathing, flesh and blood? Well, for the 358315 HP I can't say for sure because I haven't shot anything with that bullet yet (that should change this winter). However, for the other cast HP’s that I've used on game, yes those trends do seem to hold true. For example, a couple of years ago I shot a 250 lb hog with a 238 grain .338 cast HP (Lyman 33889 HP) at 1600 fps. It expanded beautifully, stayed together and punched right on through. The hole in the far-side ribcage was almost as big as a 50 cent piece. The pig died quickly. Last year I saw a huge old boar shot with the 330 grain Gould HP (Lyman 457122) at about 1500 fps, and that bullet performed superbly -- it expanded nicely and punched through a substantial pile of pork and very thick pigskin, and kept right on going. What happens if they're pushed faster? Well, a while back I gave a friend of mine some 311041 HP’s for his trusty .30-30. He worked up a very accurate load at about 1950 fps and took it hunting. He found a whitetail doe, quartering towards him, and shot her in the chest. The base of the bullet did exit the far-side ribcage, but Jim said the entire chest was bloodshot and the entrance wound was the size of a quarter, indicating early and violent expansion. I suspect that if this bullet had been going a little slower, there would have been less bloodshot meat (but this load sure does make a dynamite varmint load!). Loaded .38 Special round with a 358477 HP cast to a BHN of about 8, and a recovered bullet after being fired into water at about 1000 fps. So, to summarize, the expansion properties of a cast HP depend largely on two factors -- the impact velocity and the alloy that they are cast out of. When the anticipated impact velocity is on the order of 1000-1200 fps, then one can expect to get controlled mushrooming. Alloys that work best in this velocity range are those with a BHN of 8-10 (like 20-1 lead/tin, or 1:1 WW and lead). When the anticipated impact velocity is in the range of 1200-1600 fps, then you can expect cast HP’s to hit hard and expand beautifully. These loads are best served by alloys in the 10-13 BHN range (and WW alloy works just fine). Once we get above 1600 fps, things start to get a little touchy. For impact velocities of 1600-1800 fps it is useful to break things down a little bit. 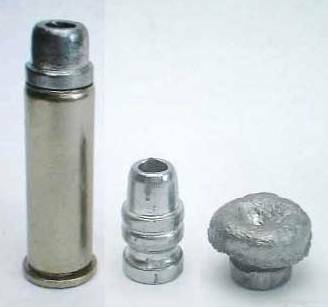 Some bullets with larger cavities (say greater than about .125" in diameter) will fragment at 1800 fps, while others with smaller cavities (generally less than about .100") generally don't fragment as readily at 1800 fps. So for the bullets with the larger cavities, it may be desirable to hold the velocities down closer to 1600-1700 fps for optimum bullet performance, while the bullets with smaller cavities might stand up to a little more speed. The velocity range of 1600-1800 fps is best served by alloys with a BHN of 12-14. Once you get the impact velocities up above 2000 fps, they all pretty much explode. At these speeds just about all cast HP’s all become violently fragmenting hand-grenades, and while this is clearly less than ideal for big-game hunting, they can make some spectacular varmint loads! So, the bottom line is that with a few cents worth of scrap metal and a little bit of your time you can make premium quality handgun hunting bullets that will deliver excellent performance on thin-skinned, non-dangerous game, all for the purchase of a bullet mould. In the case of cast HP’s, the old adage of "Moderation in all things." has a great deal of merit. Moderate velocity, coupled with moderate bullet hardness, results in first-rate terminal performance. The old-timers were on to a good thing! Warning: All technical data mentioned, especially handloading and bullet casting, reflect the limited experience of individuals using specific tools, products, equipment and components under specific conditions and circumstances not necessarily reported in the article or on this web site and over which The Los Angeles Silhouette Club (LASC), this web site or the author has no control. The above has no control over the condition of your firearms or your methods, components, tools, techniques or circumstances and disclaims all and any responsibility for any person using any data mentioned. Always consult recognized reloading manuals.